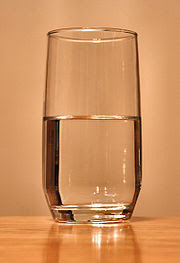 Image: Will your glass be half empty or half full this year? I've been thinking about the annual New Year's celebration most of us so joyfully participate in and have come to realize how closely hope (with all those New Year resolutions and well wishes of a Happy New Year) is related to the holiday. Hope is a good thing, a positive thing (for lack of a better word.) According to Wikipedia "hope is a belief in a positive outcome related to events and circumstances in one's life." If there is anything we all want it's a positive outcome. It might be losing five pounds or fifty pounds. It might be the belief that one will conquer a plague of continuous bad frizzy, wild hair days. It might be that a truly awful year, might be replaced by a shiny, cheerful new one. Or it It might be that the economy might unexpectedly change for the better or that a new president of a powerful country can conquer the overwhelming challenges that face him. Overall the world is a better place with hope. New Year's Eve and New Year's Day for example would not be as fun without it. Wouldn't it be something if we all sat around predicting our dooms on New Year's instead of crafting resolutions? Or how would we feel if we said "Happy Doom's Year" to everyone instead of "Happy New Year"? As a parent of a special needs child, hope is believing that my child will continue to develop, improve as a student, and learn to cope with the extra challenges in life that he faces. Sure I want to keep my weight in check and my curly, sometimes wild hair in place. But in terms of hope, the desire to see positive outcomes for my child (well both children actually) is stronger than most other desires. It's a helpful desire that overcomes the overwhelming emotions this parents feels when taking her child to doctor on a list of specialists her child must see or if her child has an extreme meltdown or a so, so report from school. There is also the hope that she can successfully balance the needs of her child with autism with the needs of her typically developing child--which is one of the biggest, most daunting challenges she faces. However, despite all the challenges, hope is one thing that is always there to grasp. Hope, as they say it, springs eternal in this parent's soul. To Casdok and My Support Blog: Thanks. To Anonymous: Glad you liked the post. Hope your Iep meeting goes well.